It was so cool to look through the telescopes, and to visit this family owned planetarium. We enjoyed the planetarium show. It's a small operation, but very well done. Our tour guide DAY-bee was great. He picked us up at our hotel, drove us up to the planetarium, then we visited a local restaurant afterwards. He was a very good tour guide, not at all stressful for us two introverts. We had our hotel front desk call for us to verify the booking, since neither of us speak Spanish. A treat for budding astronomers. This was great experience and highly recommend. Deybi was the tour guide and very knowledgeable. The market was very interesting and a must see with the guide. Fantastic tour arranged by Valentin. We wanted to do something different in Cusco, and the planetarium was definitely worth it! 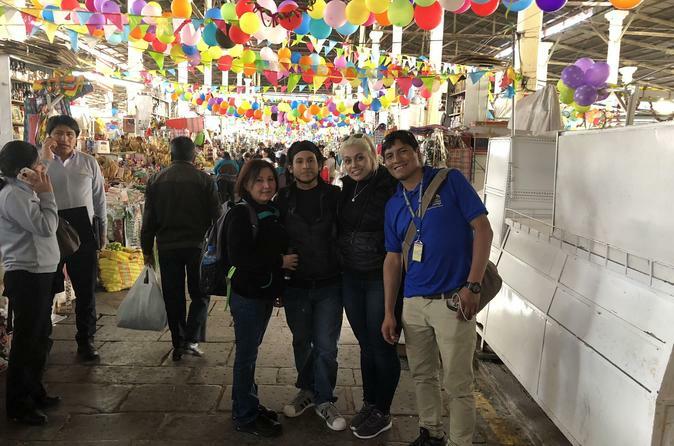 Valentin first took us on a tour of the local market in Cusco, and showed us around all the odd things in the market, providing a great insight into the culture of the community. Watch out for the juice/malt beer ladies - the water is boiled apparently, but be sure to provide your own bottled water if you have a sensitive stomach. The pisco sour tasting was a lot of fun - and strong mind you. The location of the bar was amazing, we got an entire view of the square seated from one of the moorish balconies. The planetarium was fascinating. Clearly apparent that the small family run business was very knowledgeable and interested in education patrons about the relationship between in the incas and the stars. This was followed by a dinner of chicken - delicious! Great experience with an extremely knowledgeable guide! The tour started at the town market where we got some good background information on some of the local produce and history of where some of the items come from. My mom wanted to purchase some local items as well and the guides were able to help in our negotiations which was awesome. After the market we headed to the Plaza de Armas and had the local booze beverage of choice, Pisco Sour. The drink is delicious and teeters a bit on the sweet side with some sour brought in from the lime. It's almost like a sour punch candy. After enjoying the scenery of the town square from a second balcony view along with the drink, we headed by bus to the planetarium. The experience there was awesome as we got some background information on what stars are visible from the skyline there along with why the stars were important to the Quechwa Inca. Our night was cloudy unfortunately so we were only able to see a few stars but they have some very nice telescopes to star gaze with if the weather holds up. After this we headed to our last stop which was a meal with rotisserie chicken, Peruvian style, and french fries. It was a delicious meal where we got a chance to get to know our guide a little better while tasting some of the best chicken ever. Fantastic experience all around which I would highly recommend! Amazing! Our tour guide Valentin was so knowledgeable and we enjoyed every minute of this tour. Was of favorite tour on our trip by far! This was a great evening in Cusco, after a city tour including San Pedro market and a Pisco Sour at a great little restaurant with views of the town square we met up with the planetarium group. Up to this point it was just the two of us with our awesome guide, whom we felt like a friend who was fun to talk with and was very informative. When we met up with the planetarium group, our guide was on hand to make sure we had good seats on the bus, blankets at the star gazing. We really enjoyed every bit of this evening, which also included dinner following the planetarium visit. The guide picked us up and dropped us off at our hotel. Very relaxed tour...liked Herlin the guide very much standing in for his brother in law. Good communication and insights into Peruvian customs and culture. Loved the Planetarium. Does not get 5 stars only because restuarant OK but might have preferred a n even more traditional restuarant. Good insight into Cusco. Valentin was great! 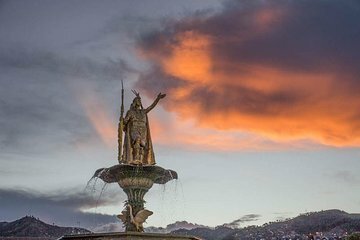 I would definitely recommend this tour for people who would like to get away from the areas geared toward tourists, and who want to explore parts of the city with someone familiar with its history and people. Another plus for me was that the planetarium we went to is family-owned, and the woman in charge is such a nerd in a good way! I learned a lot and would have booked another tour with Valentin, had I more time in Cusco. Great tour with very knowledgeable and experienced guides Valentin and his nephew. We were picked up at our hotel and taken first for a tour of the San Pedro Market. Valentin did a great job of teaching us about Cusco traditions as he took us through all of the colorful vendors. Next we went for a local Pisco Sour and then met up with some other tour groups for a trip to the Planetarium. This was my favorite part! Getting to learn how the Incans interpreted the skies and then stargazing through telescopes was a truly unique experience. Overall had a great time and would highly recommend! We had a great time with Valentin on this tour through Cusco. We did this on our first day and found it to be a great intro to the city. I loved seeing all the different foods in the market and getting to try a few. The Pisco sour was great and came with a nice view of the Plaza at Sunset. Our guide Valentin was awesome! He was informative, friendly, prompt, and eager to help us learn about his city.